The US ambassador to the United Nations on Wednesday rejected calls for opening negotiations with North Korea to defuse escalating tensions, saying North Korean leader Kim Jong-un is "not a rational person." Amb. Nikki Haley also turned down China's suggestion that the US halt annual joint military exercises with South Korea in exchange for Pyongyang's suspension of its nuclear and missile activities. She also said the US is reviewing all options on the table. "I appreciate all of my counterparts wanting to talk about talks and negotiations. We are not dealing with a rational person. If this was any other country, we would be talking about that and it wouldn't be an issue. 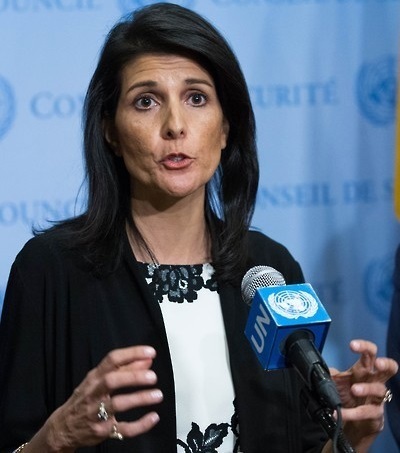 This is not a rational person who has not had rational acts, who is not thinking clearly," Haley told reporters after an emergency UN Security Council meeting on North Korea. But State Department spokesman Mark Toner said Haley's point was that the North's "behavior" has not been rational. He also said the US remains open to dialogue with the North with the aim of returning to credible and authentic negotiations on denuclearization, and the North should take meaningful actions toward the goal. "Efforts up until today, whether it's six party talks, whether it's sanctions, all of the efforts that we have taken thus far to attempt to persuade North Korea to, again, engage in meaningful negotiations, have fallen short, to be honest. So we need to look at new ways to convince them, to persuade them that it's in their interest," he said. In Beijing earlier Wednesday, Chinese Foreign Minister Wang Yi likened the US and the North to "accelerating trains coming towards each other with neither side willing to give way" and called for a compromise in which the US halts exercises and the North suspends weapons activities. Haley said there's nothing wrong with the routine exercises. "The military exercises that the US has been conducting with South Korea, we have been conducting for 40 years, annually every year. And we always notify North Korea before they happen. We're very transparent. We're very open. And we've always been clear on that. We've always thought that was very important," she said. The North's latest missile launches earlier this week were seen as a response to the annual exercises that the US and the South kicked off last week. Pyongyang has long bristled at such maneuvers, denouncing them as a rehearsal for invasion. Haley also rejected China's protests over the deployment of the THAAD missile defense system in the South. "In terms of the THAAD with South Korea, tell me why we wouldn't do that THAAD in light of 24 ballistic missiles, in light of two nuclear tests, knowing that we're going to protect our allies. We are not going to leave South Korea standing there with the threat of North Korea facing them and not help," she said. "The reason for THAAD is because of the actions of North Korea. We have not seen any goodwill coming from North Korea." The envoy also said the US is reviewing its strategy to deal with the North. "I think all the options are on the table now," she said. The emergency meeting came a day after the council adopted a press statement that strongly condemned the North's latest missile firings as a grave violation of Security Council resolutions. South Korean UN Ambassador Cho Tae-yul said that increasing pressure is the only remaining option for the North. "All kinds of options have been exhausted so far," he told reporters. "The only available means to change the North Korean behavior fundamentally is to continue to keep up the pressure and sanctions on North Korea." Cho also rejected the idea of halting military exercises in exchange for a nuclear freeze.